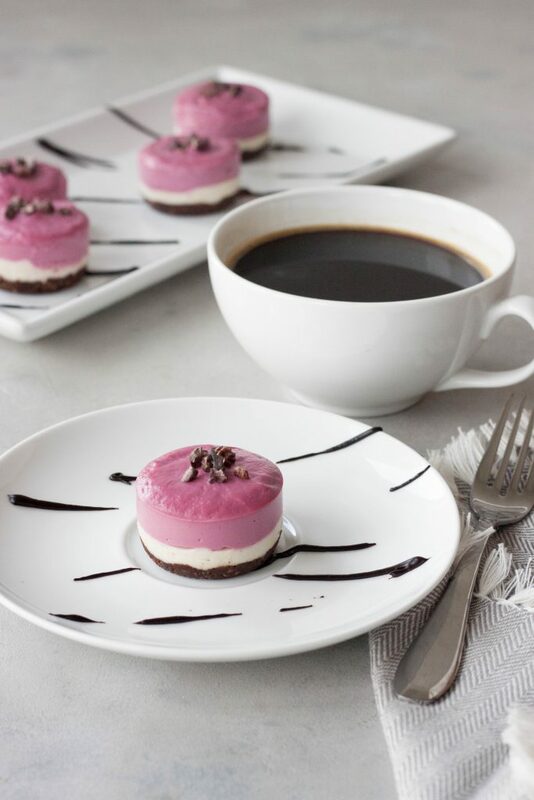 Mother’s Day is right around the corner and this beet loving mama thinks these Mini Beet Cacao Cheesecakes are perfect for Mother’s Day! There is nothing I love more then being a mother and that is why things might be a little quieter around here in the next couple weeks. Still posting and will be trying to keep up on social media as much as possible but while dealing with some medical issues and unknown in our family I don’t know what the coming weeks will look like. I might be posting a little less or a little slower to respond to comments. I do have many recipes written, tested, and planned but it will come down to time to go through the photographs and get the posts written. Family comes first and that is where my focus needs to be right now. Thank you for your understanding. 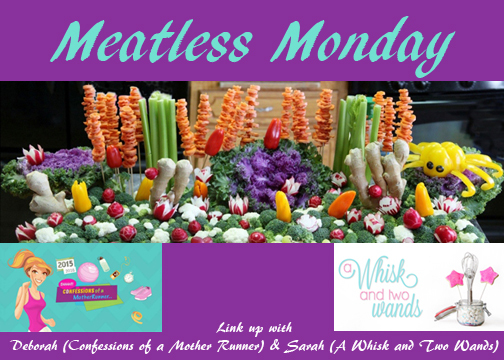 I’m planning on keeping up my Monday posts for Meatless Monday and thank you for joining my co-host Deborah and I for hopefully another fabulous and inspiring link-up! Now to this un-beetable recipe. A delicious no bake cheesecake that is dairy free, gluten free, vegan, and paleo friendly! This creamy cashew based cheesecake is a favorite and something I make for many get togethers and even those with no food sensitivities, allergies, or restrictions love it. It’s easy to make, only taking a little prep time but the hands on time is very minimal and it can be made ahead. If you don’t have a mini cheesecake muffin pan you can use a silicone muffin pan (silicone so you can easily pop them out) or use a standard 9″ Springform pan. Naturally colored with beets, can’t beet that bright pink color! 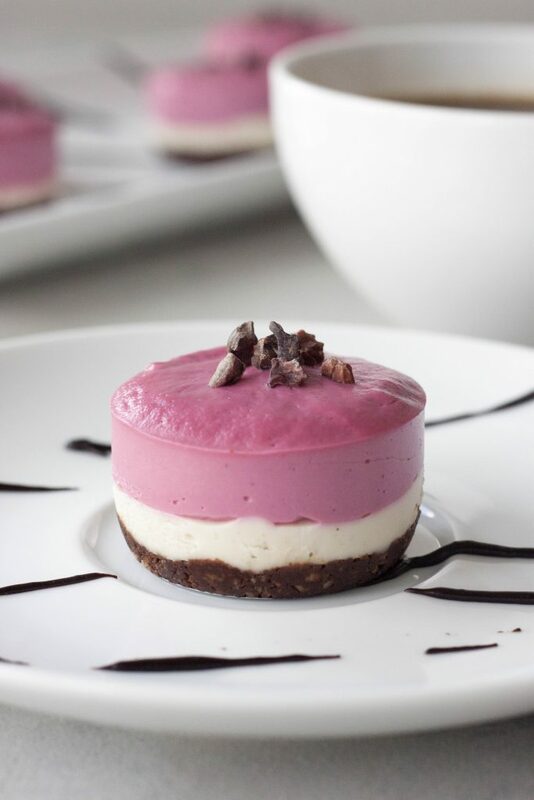 If you’re a regular reader you know I LOVE my beets these creamy cheesecakes are speckled with vanilla bean and a hint of cacao in the crust and crunchy cacao nibs on top making for a delicious treat. There isn’t much to say about these beautifully layered cheesecakes so I’m hoping the photos speak for themselves. I will say they are a delicious way to eat your veggies and get kids, or anyone, to eat beets! 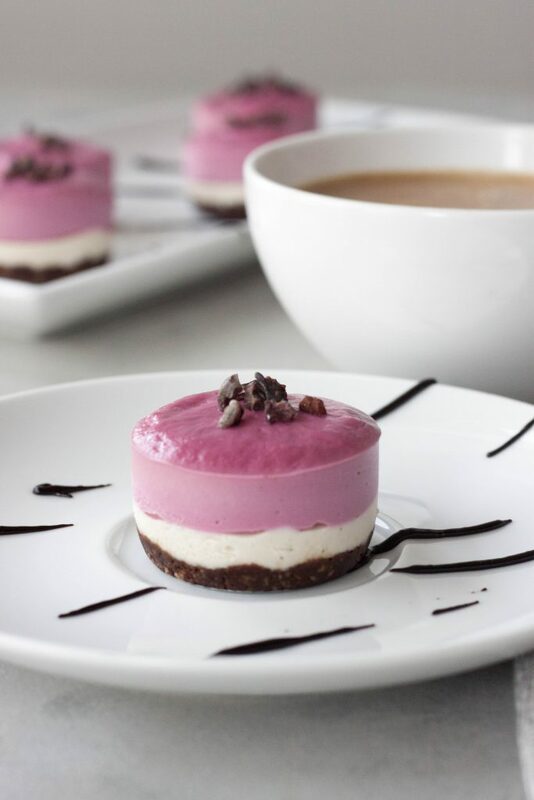 With a hint of cacao and naturally colored with beautiful beets these mini cheesecakes are sure to brighten any mamas day! *As much as I love precooked beets like Love Beets I would not recommend using them in this recipe as they did not result in nice bright pink color and more were needed resulting in change in texture and taste. Start with a little beet and depending on size you should only need a partial or whole beet but just in case I noted 2 in the recipe in case beets are small or you need more. Beet juice can also be used but I recommend fresh or cold pressed as again you will get the best results. If making a standard 9″ cheesecake you will need to let it sit approximately 3-4 hours before serving and will want to remove and slice approximately 20 minutes before serving or move from the freezer to the refrigerator an hour before serving. Start by soaking the cashews 4 hours or overnight and placing the canned/boxed coconut milk in the refrigerator. Place nuts (almonds/pecans) in a food processor and chop to a course flour texture. Add in cacao powder, salt, and vanilla pulse till combined. Last add in dates and coconut and process until the mixture comes together. The mixture should stick together when you pinch it. Press mixture into the bottom of a mini cheesecake pan, about 1-1.5 tablespoons in each mini cheesecake mold, about 2 tablespoons if using a standard muffin tin. Place the pan in the freezer while you make the filling. Rinse and drain soaked cashews. Place cashews, maple syrup, lemon juice, and vanilla into your food processor, or Vitamix, and blend until it starts to get creamy. Add in coconut milk and blend until smooth and creamy, scraping the sides as needed. Remove pan from the freezer and spoon approximately half of the filling into the molds on top of the crust, a nice rounded tablespoon per mini cheesecake mold. Gently tap the bottom of the pan on the counter to remove bubbles and even out layer. Place pan(s) back into the freezer. Add a small amount of chopped beet or beet juice to the remaining cheesecake mixture until desired color is reached. The more you add the more beet flavor you will have and the brighter the color so the amount will be based on personal preference. Remove pan from the freezer and spoon on top of the plain cheesecake later. Tap the bottom of the pan(s) again gently on the counter to remove bubbles. Sprinkle with cacao nibs. Place in the freezer for 1-2 hours, or until set. Remove from the freezer, about 15-20 minutes before ready to enjoy to let thaw slightly. It is easiest to remove the cheesecakes from the pan while still frozen or as soon as they are soft enough to do so. Enjoy! 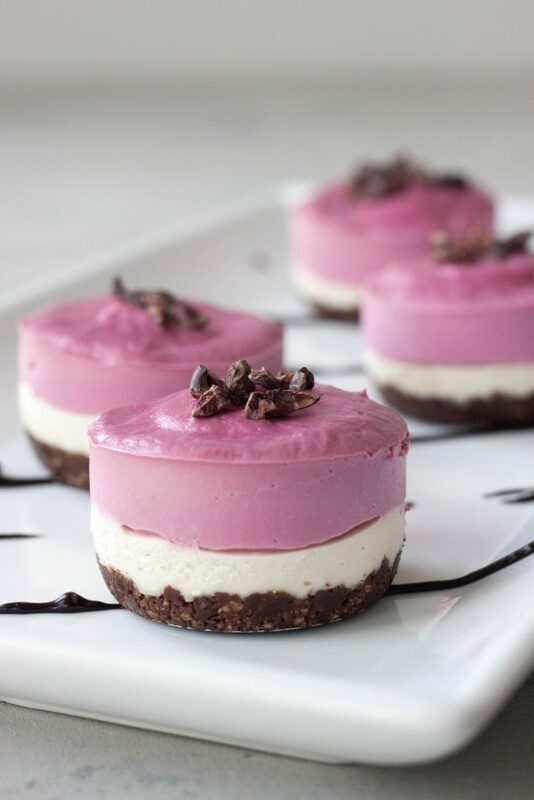 Delicious no bake Mini Vegan Beet Cacao Cheesecakes are also gluten free and paleo. As soon as I can eat again, I am making these! YUM! Those are beautiful and yes perfect for mother’s day or any day! OMG! These look divine. Definitely pinning for the next time I have beets (and/or feel like being fancy)!! Love your use of beets to get that gorgeous color! Such a creative and good looking dessert! Those layers are SO gorgeous! 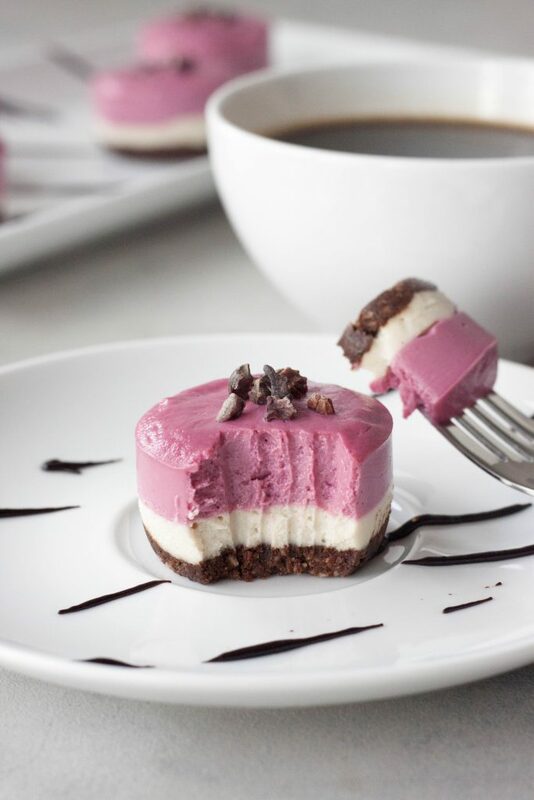 I am swooning over these mini vegan beet cacao cheesecakes! Can’t wait to try them! Those layers are perfect! I love that you made it with beets too. So delish. Oh my goodness, I’m loving these! So pretty. They sound delicious! How perfect are these for Mother’s Day?! Adorable and perfectly bite sized! I love it! These are just darling! I’m all about the single-serve cheesecakes and the beet makes it SO pretty.